I like this compilation quite a bit. Sure, it seems like just about everyone will argue about what the “best” of any artist is. Still, this has a good cross-section of material. I reviewed one of the songs here on a recent live release. For the sake of consistency, that track review is adapted for use here. 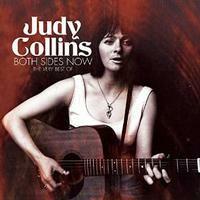 I’d highly recommend this as a one stop start for a new Judy Collins collection. A lot of people know of this as a Judas Priest song. Well, Joan Baez actually wrote and is the original performer of it. This rendition features Collins joined by Baez. While I prefer the Priest rendition, this one is better to me than the original is. I love the powerful arrangement, and the two voices work well together. I actually like this one a lot. It might seem obvious, but I’ve always loved this song. I bought an earlier Judy Collins compilation disc specifically for this. The hippie kind of arrangement works. The lyrics are great. The whole song still really works for me. Sure, it’s dated, but that’s part of the charm. It’s a nostalgia thing in some ways. Yet, it’s a good song outside of that, too. A compelling number, this has a lot of country in the mix. It’s packed with emotion, too. There are definitely some hints of gospel music in this, too. More of a pure folk number, I again like the merging of the two voices. It does feel like something Stills might do with Crosby and Nash. This is accessible and effective. I absolutely love this song. Piano is the main musical accompaniment here, but symphonic strings and other keyboards are included, too. This soars and seems full of emotion. In a lot of ways it reminds me of something Renaissance might do. Drenched in strings, this song is kind of a classic. I’ve never been a big fan of it, though. It’s alright, but not my kind of thing. Now, this is more like it. It’s more of a delicate and pretty old world styled folk number. It has a real medieval kind of vibe to the melodies. I don’t like this song at all. I’m not talking about Collins’ version in particular. I don’t like this at all. This version is acapella with Collins taking the first section alone. She’s joined by a choir later. This is a little too precious for me. The symphonic strings creating a musical styled arrangement just doesn’t work for my tastes. It’s not bad. It’s just not my thing. The story of this song is sad. The arrangement seems to combine the previous cut with something a bit like country. This doesn’t work that well for me musically. More pure old fashioned folk music, I like this one quite a bit. The arrangement gets quite involved and quite powerful. The melody and arrangement, with its lilting kind of progression, is odd, but powerful. It’s such a bittersweet tale of a woman in her twilight years. It’s the type of thing to which most people can relate. It’s pretty and quite compelling. This Simon and Garfunkel piece gets a nice piano and strings dominated rendition here. This is a good song, but not one of the best in the set. The more powered up section later works pretty well, though. This piano and voice cut is pretty and effective. Starting acapella, this is also based on piano in terms of the musical arrangement. It’s quite pretty. It’s a great rendition/rethinking of the classic piece. Another with a stripped back piano and voice arrangement, this is solid, but not a highlight. Now, this one is a highlight. I absolutely love this live version of the classic Harry Chapin song. I’d say that for me this is every bit as good as the original. Pretty and poignant, this is another of the standouts cut here. That’s on the strength of the melodies and the voice. This is another piano and vocal song. It’s also another powerful one. I’ve only ever heard the CSN version of this song before. I really love this rendition. It’s got a hint of country. It’s a powerful tune, and the interplay of voices is great. Intricate and evocative, this is a powerful piece of music. It’s again not far removed from something I could imagine Renaissance doing. The “Wizard of Oz” had a song earlier. This time Collins turns to Willy Wonka. I like this a lot more than the version in the movie. It’s pretty and hopeful and fun. This is powerful and quite beautiful. It’s arguably got one of the most potent vocal performances of the set. Here Collins covers the Beatles. I remember reading that at one time this was the most covered song of all time. Well, Collins’ version is good. It’s not a big change or anything. It’s just a solid and respectable rendition of a song everyone knows. Piano and Collins’ voice weave a real slice of life story. I think this is my favorite version of this song from anyone. It’s just a lot of fun. It’s also quite dramatic. More of a group song, this has a number of voices. It’s a real folk and country styled piece. I’m a big fan of Arlo Guthrie, and I was glad to hear him on the tune. This is just a lot of fun.